That same April, I had just taken my first of what will end up being three board exams to obtain a medical license in the US. It had been a year where our political landscape shifted, where we saw the effects of a changing America on our communities. It came after the death of a classmate, the loss of personal relationships, and what sometimes felt like a loss of personhood. One week after reading Mukherjee’s article, I started my third year of medical school. Third year had been a re-start for me, navigating the new landscape of clinical wards, the OR, teams, and getting closer to classmates in a professional setting. T.S. Eliot, one of my favorite poets, infamously wrote “April is the cruelest month”. Death can seem commonplace in medicine because it is a part of the job. But it affects one differently each time, perhaps not in the moment it happens, or the days that follow. At the end of my third year, I vividly remember certain patients down to what they were wearing or eating or doing. Often in medicine, one has to move forward and on to the next patient or task. Some may call this callous or ask: “How do you deal with seeing death often?” I deal through the hours it takes to craft a piece of writing, or the feeling of knowing that you are alive to run or walk during 30 minutes of cardio, or even a drink after work with friends sharing stories. In the Fall, I was on the organ transplant service during my general surgery rotation. My attending told me I had the choice: to scrub in for the organ procurement or to wait in the OR while the donor patient died. He said, “We are technicians as the transplant surgeons. We don’t often get to or should see this side of it. Tell me what it feels like for you.” I chose to wait in the OR. The last organ procurement in which I participated was a donation from a 26-year-old female who had overdosed on several substances. We made an incision from her sternum to pelvis. My job was to excise the splenic lymph nodes for research once the organs of interest had been procured. I was 26 years old, too, and for a moment I thought, “Is this what my body would look like too split open on a table?” We had all become so task-oriented due to the constraints of time in organ procurement, but it was in the quiet moments afterwards when the resident and I were closing her abdomen back up, that we really saw her as a person. Later during my Ob/Gyn clerkship, an expectant mother of twins had one twin die in utero, while the other survived after a stat C-section. The mother was a teenager. It wasn’t the death that took me aback. For me, the aftermath was worse because life moved on. It was walking into the mother’s room to see her watching cartoons the next morning or seeing her in the NICU with her other baby. She was a child herself, in need of support and counseling, something I’m not sure she received. As I ended third year in May, what was a long, different, exciting, but tumultuous year, I had never felt Mukherjee’s words more significantly. The best aspects of patient care that I saw, the ideas that sparked research or interventions from the patients I mention above, the advocacy or policy changes that come from a specific deaths are the result of deep emotion, compassion, a profound sense of loss, and a will to find meaning. Positive change and healing comes from a lack of numbness, from sharing stories with one another. That is the beauty. The ability to see death so intimately, to be the last person to touch, stitch, hold another human being before they take their last breath, to be able to move on from that and look for meaning. And numbness or dissociation, while easy, and so convenient in the moment cannot and does not last. It is a stopgap. A plug into an ocean, an unsustainable emotion. So be ok with feeling grief. Feel it in that moment. Grief dissipates only when it is fully felt. No conflict has been resolved, no trauma isolated, and no act of recovery or healing has come from not feeling, at least in my experience. In medicine we often view death as a failure. In the hospital, we talk about curative measures and treatment. But as we all know before we get here or at least during this journey, death is often a complicated thing. It is sometimes a relief at the end of seeing suffering. Other times shocking and accidental. Sometimes it is preventable. But it is always the process of seeing life – and the story that went along with that life – stop. But the beauty we create as human beings from death, and the way in which we find purpose from it, especially in medicine, is truly a remarkable trait I see in my colleagues, mentors, and teams every day. And for that opportunity and responsibility, I am grateful and honored. 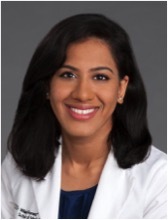 Vaidehi Mujumdar is a fourth year medical student at Wake Forest School of Medicine with interests in cancer equity, the intersection of global surgery and women’s health, and qualitative research methods. She graduated from Dartmouth College with a double major in anthropology and biology and subsequently spent two years as a Dartmouth Partners in Community Service Fellow in New York City. Her writing has been published in The Guardian, The Almost Doctors Channel, The Intima: A Journal of Narrative Medicine, India.com US Edition, Media Diversified, Matador Network, and others. Follow Vaidehi on Twitter @VeeMuj.